Look's pretty good to me and almost fit's exactly what i would like! That looks brilliant! The only thing I'd be worried about is the components inside the pouch breaking in a game. But it's a good idea! It's much easier to drop something in a big bag, than insert something into a slot. Especially if you're in a hurry. That said, it boggles the mind! How does it work?! @Ed Really he said it's slower to put them back in to other mag Pouche's but this pouch speed's it up honestly though if you can't put a mag back in it's pouch you need to train! The link to Buy and if you click on the Left for Video's of it they Jump on it trying to break it! I think anything that speeds up mag changes is a brilliant idea, shaving off a few more milliseconds is a life saver and if airsofters start buying them it'll bring the price down for who they are intended for. 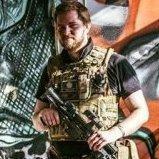 The fastest I ever managed to do a mag change was with my 58 rig and the Sten, which was under 2 seconds, how fast should you be able to change a mag say on an M4? The FN2000 I'm still getting used to, you tend to lean the weapon away from you when you change mags so you don't hit the rig. I might go and slip into my rig and see how fast I can change the mags, but speed isn't always important. Can now do the G36 in under 2 seconds but that involves dropping the mag rather than putting it away. The guy in the vid suggested it was slower with a dump pouch as you are reaching around behind you, and then moving your arm back to the front to grab a new mag. He's got a product that allows you to quickly put your mag away and take a new one in 1 swoop. Yea as craig said, with a normal pouch yes its slower but with this type you put the old one in as you take the new one out.. I get that the arm movement is less, but it'd take some practice to be able to slot the used mag back in that quickly. Also, you're keeping your used and new mags in the same place, if you're under too much fire to focus on what you're doing, you could easily take out an empty mag by accident. As for reload time, using a dump pouch and open topped mag pouches it takes me about 3-5 seconds to reload my L85, I don't think this system would speed that up much just because I'd have to fumble to get the mag back in a pouch that size, sure you save time on getting the new mag out, but overall I think it'd slow me down, personally. It's a snazzy system sure, but whether or not the pros are enough to outweigh the cons, I'm unsure. I wonder if it's a reliable system, be good to see if it copes after being submerged in muddy water or filled with sand etc. I dont really get on with dump pouches and im sure im not the only one. Plus you have to deal with the ever growing bulge on your belt / back / leg. I generally know which mags are empty etc, as i work right / left on my belt rig, and left to right on my vests. Empty Mag space = go to the next one along for fresh mag. I wonder how much they'll be, I wouldn't be surprised if they were massively over priced like the FastMag or RAMP pouches..
*You have to Navigate to them although if you go to the actual Youtube video Page it has the Link right their but link's apparently won't work when coming for me..
Had a go, 3.5 - 5 seconds, doesn't seem to matter if I'm using the FN2000 or the AK5. I'm using a dump pouch on my left side, if I just drop the mag 3 - 4 seconds, doesn't seem to make a great deal of difference but I'm not used to just dropping my mags. I think this mag pouch system has some benefits and I would have though with the sueing culture in the US and him being ex-USMC he would have made sure it works in horrible conditions. The link worked this time I'm sold on them but there is a back log on orders and the price is $29.99 with free post if you order more than three (but this is a limited time offer) but this would be for the US I should imagine. Apparently they're getting some AK47 and 308 (7.62) pouches in for the summer, which makes a lot of sense. At the moment I haven't got a dump pouch so I have been putting my mags back into my pouches. I don't like using pouches that take 2 M4 mags in the same slot, they just don't feel secure to me. But I really like this idea, essentially its gun to mag pouch back to gun. Instead of gun to dump pouch to mag pouch to gun. Cutting out a step is good idea. A set of these have made it onto my wish list for when I have more money to splash about.